If just one percent of the Saharan Desert were covered in concentrating solar panels it would create enough energy to power the entire world. That’s a powerful number, and the European Union has decided to jump on their proximity to the Sahara in order to reap some benefits from the untapped solar energy beaming down on Northern Africa. Just yesterday, European Energy Commissioner Guenther Oettinger announced that Europe will start importing solar energy from the Sahara within the next five years. The news comes after the Desertec Initiative was announced last year, which sets a long-term plan of about 40 years. The EU has a mission to take at least 20% of their entire energy from renewable resources by 2020. Last year they announced that they would lay a series of highly-efficient cables across the Mediterranean, build a series of solar power plants in the Sahara, and import renewable energy from across the sea. The initiative is being financed by a group of European companies and is supported by the EU government. The plan is to cover 6,500 square miles of the desert in photovoltaic systems and wind parks. Previously it was thought that the system would take 10-15 years to start to show results. However, the EU has announced that they will complete the first part of the system within the next five years and will start importing a small amount of power as a test run before the entire initiative is finished. “I think some models starting in the next 5 years will bring some hundreds of megawatts to the European market,” Oettinger told Reuters. That energy will skyrocket into the thousands of megawatts as the project proceeds towards its completion date in 2050. It is estimated that the initiative will cost $400 billion Euros. If the EU decides to scale it up — the initiative will power a large part of Europe but not all of it — they’d only need to cover .3% of the desert with solar panels to power the entire continent. How many trillions would it cost to cover just one percent of the Sahara with solar power? More trillions that are on earth? 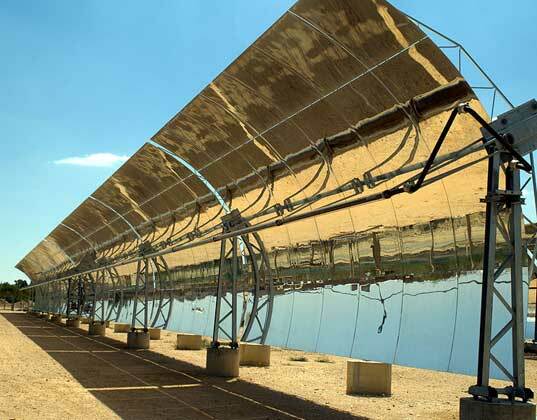 The solar power plants located in the Sahara are in fact Concentrated Solar THERMAL plants (i.e. parabolic trough and central tower), not photovoltaic. This was chosen due to their ability for thermal storage and night time power generation. 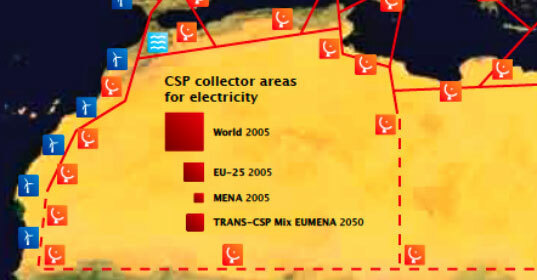 Solar Energy from the Sahara could be imported to Europe in less than 5 years. If just one percent of the Saharan Desert were covered in concentrating solar panels it would create enough energy to power the entire world. That's a powerful number, and the European Union has decided to jump on their proximity to the Sahara in order to reap some benefits from the untapped solar energy beaming down on Northern Africa. Just yesterday, European Energy Commissioner Guenther Oettinger announced that Europe will start importing solar energy from the Sahara within the next five years. The news comes after the Desertec Initiative was announced last year, which sets a long-term plan of about 40 years.